During the winter months, temperatures can vary greatly, especially here in Houston. One day it might be sunny and near 80, and the next day can turn much colder. Some winters, it even gets cold enough to frost and freeze. Then there are even those rare snow showers that occur every few years, too! Since the weather in Houston is very unpredictable, it can be difficult to get much done on the outside of your home. However, that does not mean you cannot gear up for spring and summertime projects by developing your designs in the winter. 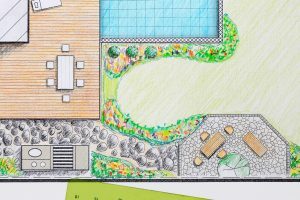 Two types of projects you can plan now are concrete patios and driveways. Even if the weather is freezing cold outside, you can still start making preparations now. Once it warms back up and temperatures are steadier, then you will be ready for your Houston concrete contractors to get to work. 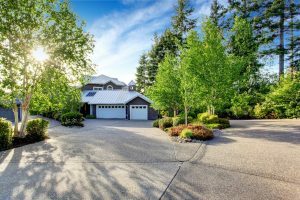 If your current driveway is older and wearing out, and it just looks bad, replacing it with a new concrete driveway will greatly improve the curb appeal of your home. On the other hand, if you currently only have a dirt driveway and are tired of dust, dirt, and other debris getting tracked into your vehicles and home, a new concrete driveway is a perfect solution. Form over function is a modern design approach, where you place more of an emphasis on how the driveway is going to look rather than its purpose. Conversely, function over form is placing more of an emphasis on the function of the drive, rather than how it looks. For instance, if you want to include various design elements in the driveway’s design, form is more important for you. On the other hand, if you do not care how the driveway looks, as long as it serves its purpose, then you care more about function. Standard gray concrete or colored/texturized finish? Some people don’t mind a standard gray concrete driveway. Other people want their driveway to stand out by having it finished in a different color, such as burgundy or tan, or having it texturized. You may even have the option of having the concrete colored when it is poured. If you want a specific color or texture of driveway, talk to your Houston concrete contractors to find out what options are offered. Do you want a “traditional” rectangular shaped driveway that runs from the street to your garage? Would you rather have a circular driveway design that allows people to easily turn around and allows you to have a center area where you can put a fountain, flower garden, or another decorative centerpiece? It can be beneficial to sketch out your design ideas on paper to get a better idea of how they might look. Your concrete contractor might also have special design software they will use so you can see “before” and “after” pictures. Do you want to include a gate? Some people have a fence around their homes and want to include a gate at the end of the driveway. If you want to include a gate, this will need to be incorporated into your design. You want to make sure the gate you select can open easily and without any obstructions after your new driveway has been completed. Do you need to elevate the driveway to create a slope away from the home? In order to pour a new driveway, your old one has to be removed. 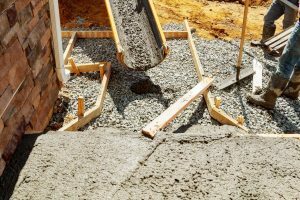 If you currently don’t have a driveway, you will need to dig out the ground to create the shape of the driveway where the concrete will be poured. If you currently have problems with water pooling near your home or running into your garage, you will definitely want to have your driveway elevated and sloped away from the home. This way, rainwater drains away from the home and toward the street. You can use many of the same design tips for concrete driveways to help you design concrete patios, with a few minor variations. You will certainly need to decide if you want traditional gray or a colored finished patio. You also need to determine what shape and size you want for your new patio. One of the biggest mistakes, which is not very attractive, is to just have a rectangular-shaped concrete patio poured right up near the back of the home. While you may want to have a patio right up near your home, you should consider if you should add other design elements to it or extend it into your back yard. For instance, one popular design is to have a rectangular patio near the home that is elevated off the ground several feet, with concrete stairs going down into your yard. Another popular design is a ground-poured patio which is rounded and uses curves on the sides facing away from the home, rather than being flat. How much direct sunlight does your backyard get? If the location of the patio will be in direct sunlight all day long, you probably won’t use it much. Consider placing the patio in a location that is partially shaded. Do you want a covered or enclosed patio? If direct sunlight is a problem no matter where you place the patio, you should consider covering it. If you want to be able to use your patio year round and not worry about rain, cold, wind, or our exceptionally hot and humid summers, then you may also want to have your patio enclosed. If covering or enclosing the patio, do you want an outdoor kitchen, fireplace, or fire pit? These are added features you could have added to your patio to get more enjoyment out of spending time in your backyard. You could even have an outdoor-friendly TV and sound system installed so you can enjoy sporting events with your friends and family while firing up the grill and “tailgating” on your new patio! Why Not Just Wait Until Spring or Summer to Design a Driveway or Patio? Concrete companies in Houston start to get busier once spring and summer arrive. Finding a contractor to help you transform your design into a project plan could be met with long delays. It is not uncommon to discover a highly demanded residential concrete contractor to be fully booked until the following fall or winter! If you want to make sure your new concrete driveway or patio is complete this spring or summer, you will want to get to work on your design now. It is equally important to start getting project quotes from Houston concrete contractors, as well. When requesting quotes, make sure to fully explain what you want and provide a sketch of your design plan. You also will want to inquire as to whether the contractor you select is able to assist with the entire project from start to finish. If not, then you may need to find another contractor to assist with the finishing touches you want to put on your new concrete driveway or patio. If you are not sure where to start your design or need inspiration and ideas for concrete driveway and patio construction in Houston, speaking to an experienced contractor now, when they are not as busy, is also a great idea! For assistance in designing and planning a new concrete driveway or patio for your Houston area home, and to request a FREE quote, please feel free to contact Cross Construction Services (CCS Concrete Driveways) at 713-244-8509 today! We have over 30 years of experience in concrete construction, driveways, and patios.